Democrats want the last stretch of the election to be all about health care, so they're launching a new seven-figure campaign targeting 20 vulnerable House Republicans. Why it matters: This is a last-minute push to try to pull voters in Democrats' direction with an issue that Democrats think Republicans can't talk about on the campaign trail. 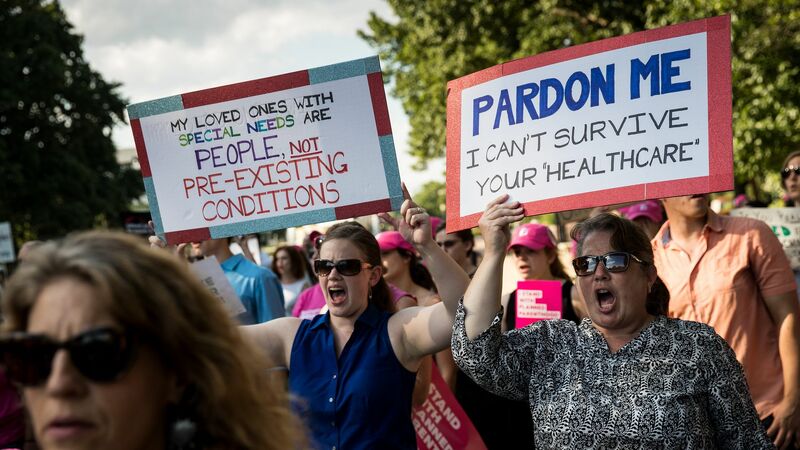 The backdrop: Health Care Voter, the progressive campaign leading this voter mobilization campaign, is targeting House Republicans in places like California, Colorado, Florida, Georgia, Iowa and Maine. Some of the Republicans include Reps. Steve Knight, Mike Coffman, Vern Buchanan, Karen Handel, Rod Blum and Bruce Poliquin. Many of the districts are rated as "toss-ups" by Cook Political Report. The campaign will span digital ads, college campuses, and all 50 states — targeting Republican incumbents for their vote to repeal the Affordable Care Act. Former Rep. Donna Edwards, who was diagnosed with multiple sclerosis, is joining Health Care Voter as a co-chair.